Here are some samples of my art and design work (drawing, painting, graphic design, mixed media art, textile art, photography, custom framed gifts). 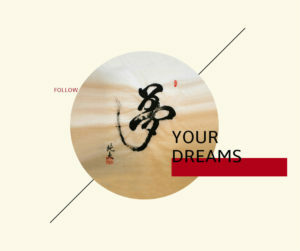 ‘Dream’ graphic, 2016: My husband’s colleague retired and does Japanese shodo (calligraphy) as a hobby – he made us a calligraphic work that says dream – and told my husband to follow his dreams. I was touched by this gesture and felt inspired to make this graphic. Tokyo, Japan. Bookmark created for cast of TIP’s production of ‘The Language Archive,’ 2016. Design features lines in many languages from the play. Printed on cardstock and laminated with eyelet detail and ribbon finish. Tokyo, Japan. Sumi-e painting of parrot, 2016. Completed under tutelage of Shoko and Suiko Ohta. Photo taken at Kakizome Party at Tokyo American Club. Tokyo, Japan. 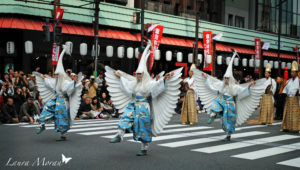 Photo of Shirasagi-no-mai (White Heron Dance) performed in Asakusa for Culture Day, 2013. Tokyo, Japan. 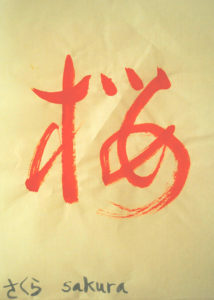 Beginner level shodo (Japanese calligraphy) – kanji for sakura, or cherry blossoms, 2015. Completed under tutelage of Yuriko Nakamura. Tokyo, Japan. 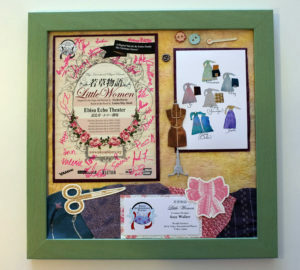 Custom framed gift designed for Costume Designer of TIP’s Little Women, 2014. Made using layers of washi paper, cardstock, vintage upcycled kimono fabric, diecuts, and buttons. I created graphic of Suzy’s beautiful costume illustrations and fabric samples and mounted this on washi paper (seen top right). I also designed a typographical version of what you would see engraved on a commemorative plaque or award and mounted this on washi paper (seen bottom center of frame with TIP logo). 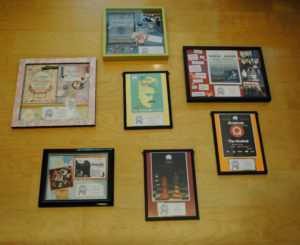 On top left is show flyer signed by cast and mounted on washi paper. Frame purchased in Tokyo. Photographed by Suzy Walker, Costume Designer. Tokyo, Japan. 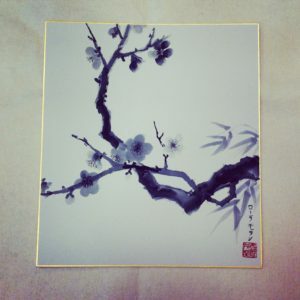 Sumi-e painting of plum blossoms, 2014. Made with Japanese sumi (ink) and brush. Completed under tutelage of Shoko and Suiko Ohta. Tokyo, Japan. 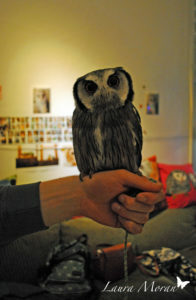 A visit to an owl cafe, Fukuro No Mise, 2015. Tokyo, Japan. Photo of cherry blossoms along Meguro River during O-hanami, 2013. Tokyo, Japan. 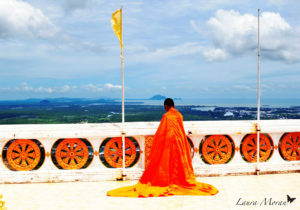 Photo of young Thai monk reflecting quietly to himself at Tiger Cave Temple, 2012. Krabi, Thailand. 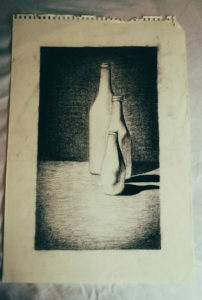 Charcoal still life completed circa 2000 under tutelage of the legendary Myron Barnstone. Allentown, PA, USA. Photo of worship service at Cao Đài temple, 2013. Tay Ninh, Vietnam. Dried blow fish with hats in Tai O Fishing Village, 2014. Lantau Island, Hong Kong. 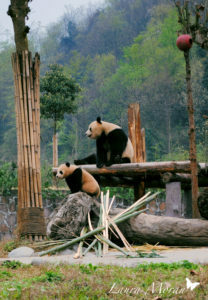 Photo of Mama and Baby Panda at CCRCGP, 2016. Chengdu, China. 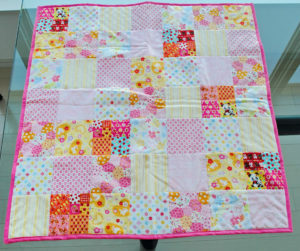 Patchwork baby quilt made with Japanese cottons, 2012. Fabric purchased in Nippori (Fabric Town). Tokyo, Japan. 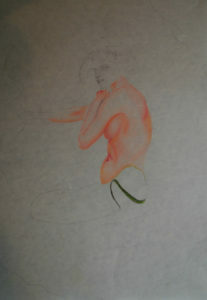 Unfinished mermaid drawing in graphite/color pencil, circa 2000-2003. Allentown, PA, USA. A special gift deserves special wrapping. For my mother’s birthday, 2012, my siblings and I created a photo book that documents her life. 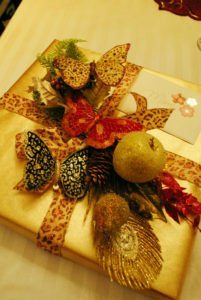 I made this gift topper by combining gilded apple, pine cone, florals, and butterflies with ribbon. Materials purchased at Michael’s Arts & Crafts. Inspired by floral arrangements by my Mother-in-law. Allentown, PA, USA. 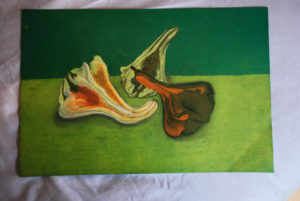 Pastel still life of squash, completed circa 2000-2003. Allentown, PA, USA. Gallery wall of custom framed gifts created for great friend and Director of many TIP shows, Alysha Haran, as a sayonara present, 2015. Combination of show flyers, show ephemera, washi paper, diecuts, buttons, and more. Each frame is to commemorate a play or musical that she directed during her two years in Japan. Tokyo, Japan. 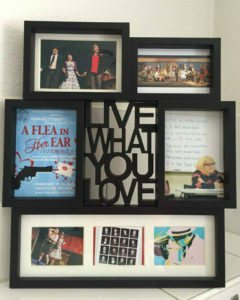 Custom framed gift for Director of TIP’s A Flea in her Ear, 2015. Combination of photographs from show (Credit: John LaTorre and Rodger Sonomura), washi paper, and show flyer. I edited ‘Kiss’ photo (bottom right) to look like pop art since show was set in 1960’s. 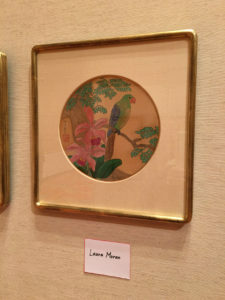 Frame purchased in Tokyo. Photographed by Michelle Yamazaki, TIP Director. Tokyo, Japan. 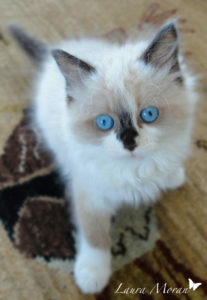 My muse: Our pet cat, Coco, as a baby, 2012. Tokyo, Japan.